These next two episodes were watched as part of a marathon of sorts. You know you're getting really invested in a show when you can watch for hours and hours on end and not really notice the time going by. Or maybe it's just because Netflix keeps auto playing the next episodes. We may never know. We have been huddled up in the Keswick in front of the TV for a couple hours now already. We didn't realize at first but episode seven and eight are the finale of season one and the opener of season two. Both extended length and cramming in a lot of info. As the show develops we have seen so many repeated themes in the imagery, colours, dialogue and music that seem to effortlessly tie all of the weird and disjointed plot points together. They keep adding in new twists and turns, but somehow those thematic elements keep it glued. You're saying to yourself "What just happened?" and "Who is that?" but deep down you know somehow it all makes sense. Many things come together at the end of season one, while a whole bunch of new possibilities open. Ed's wife Nadine make a suicide attempt, we discover Lucy is pregnant, Hank shoots Leo, the paper mill gets burned down, Leland kills Jacques Renault, Audrey is stuck at One Eyed Jacks and to top it all off Cooper is shot in the final scene. At this point in the show, we love Cooper. He is the man. He can do no wrong. Even if he did do wrong, he would be the first to admit it. It seems his intentions are pure and he has a real love and respect for all the people in Twin Peaks and wants to help them. As we find our favourite characters and get to know them a little better we wanted to know some more about their careers as actors. Kyle MacLachlan starred in the movie version of Dune, which is a sci-fi favourite of ours. He is currently the mayor on the show Portlandia which is also amazing. We recognized Ray Wise, who plays Leland Palmer, right away as he has been featured in Tim & Eric Awesome Show, Great Job! many times. Here's one of our favourite clips of him on Awesome Show, entitled "Business Hugs." At this point these messages are very cryptic and we have no clue what they mean. If anyone can solve a riddle, it's agent Dale Cooper. The log lady returns in this episode, chewing her pitch gum and spurting perplexing clues of her own. It's difficult to grasp the specifics of what she's getting at sometimes but her lines always have a certain ring and tone to them that draw you in. The night of Laura's murder is slowly coming together. The pieces are being figured out as to who was there, where they went and what they were doing. This episode closes with a dinner party between the Palmer family and Donna's family. Donna's sister gets up and reads an insanely dark poem she wrote to console the Palmer family. If it was me in that situation I think it would have had the opposite effect. Leland gets up to sing "Get Happy" and ends up having some sort of seizure like episode and collapsing on the floor. We start to realize we've been sitting in the same seats for far too long and that the marathon has to end here. More Twin Peaks next week! 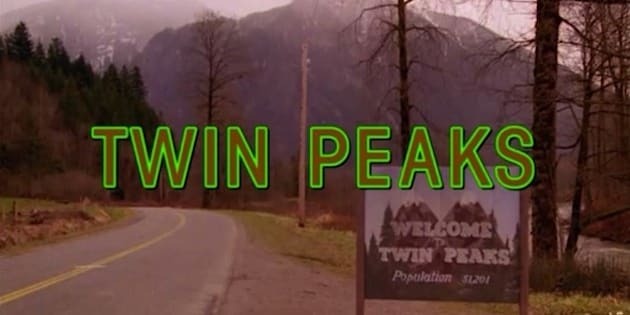 'Twin Peaks': Where are They Now?